US AGENT is armed with a Vibranium shield very similar to that of CAPTAIN AMERICA. He uses this for protection and as a weapon. Although he and CAPTAIN AMERICA have had their differences, they both agree that any threat to justice and freedom must be stopped. 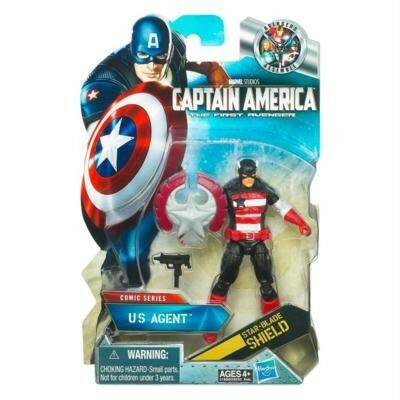 Your US AGENT figure is ready to take on whatever evil forces come his way! Help your fierce fighter wield his star blade shield against his enemies, defend him from attacks and strike back with speed and power. Even when you’re surrounded, you and your US AGENT figure can battle your way to victory!